Happy Friday! The weather here in North Texas is AMAZEBALLS right now! Temps in the 70s and green grass (and bluebonnets) everywhere. It is truly delightful! 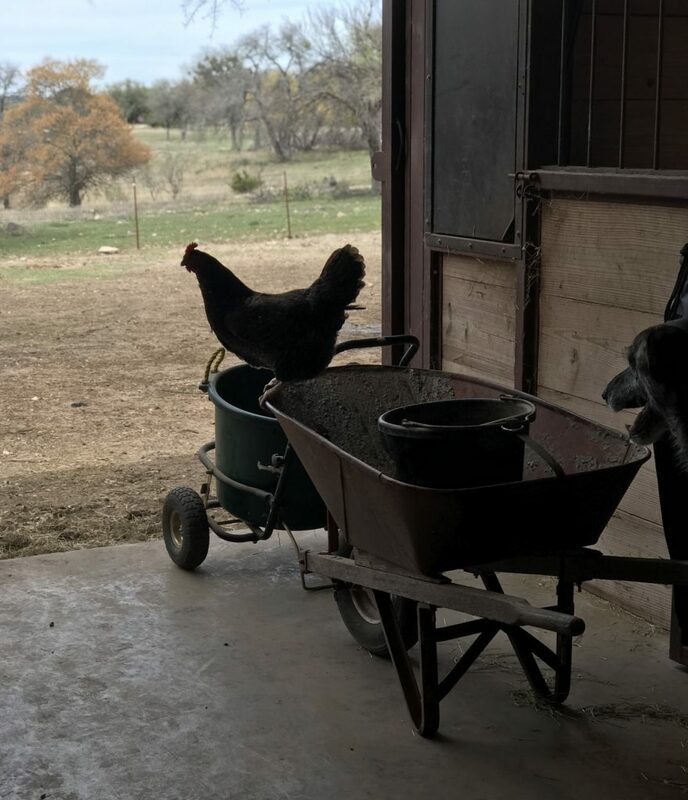 I feel like I never post pics of the chickens, so here is a chicken (one of our Blue Andalusians) with a beerhound photobombing. 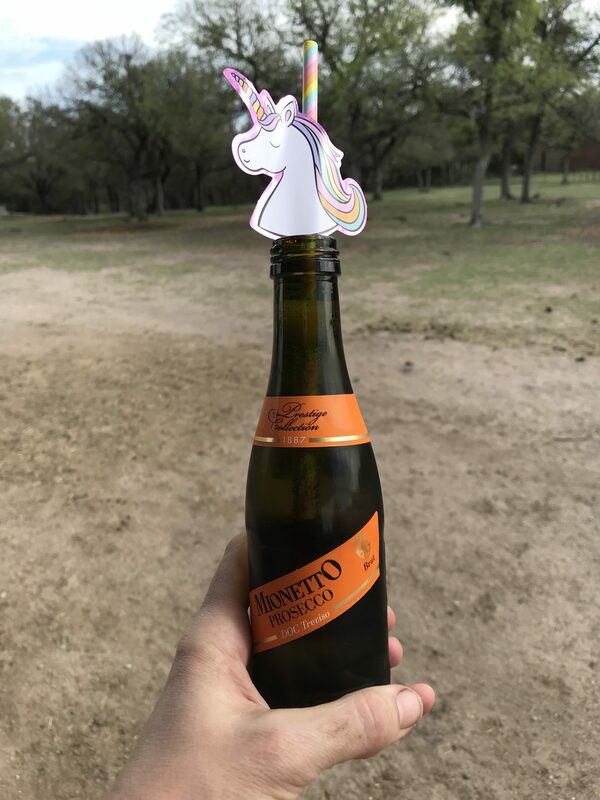 Some days you just need a unicorn and a prosecco. I had quite a lot of help unloading feed on Monday. If all goes accordingly this weekend will be the final hunt for this season. It’s always a bummer when the season ends, but exciting to get my Saturday mornings back! Now that I have three sound horses (and hopefully they stay that way) I need all the time in the saddle I can get! Up until this week we have had pretty much zero precipitation since 2017. The grass is always pretty brown this time of year, but it was starting to get a bit alarming. Well never fear, Mother Nature is here! 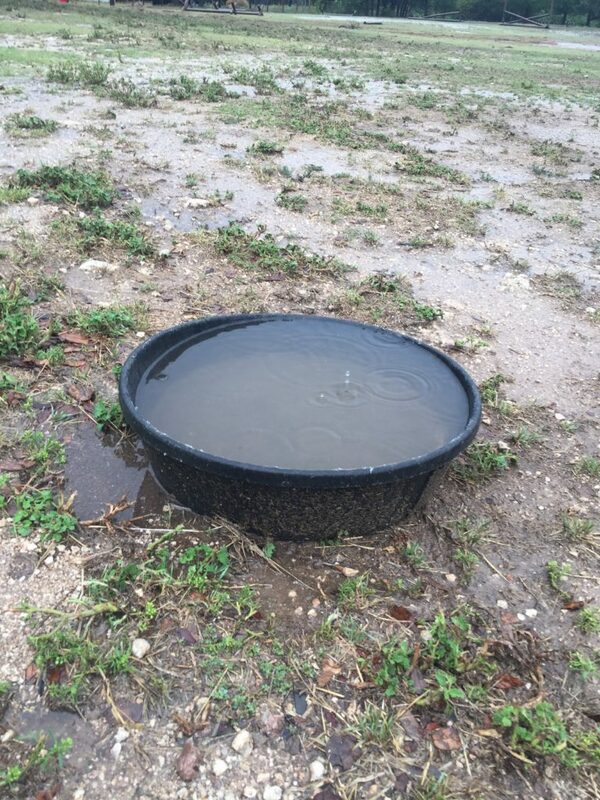 Since Monday we have gotten more than 4″ of rain in Azle. According to the rain gauge we have gotten close to 5″ at our house! It was in the high 60s and raining when I left the house yesterday morning. When I got home after work it was in the 40s and the temps were going down quickly. I felt like a horrible horse Mom because 3 of the 4 horses were shivering. I quickly got them all bundled in their warmest blankets and filled their faces with hay. 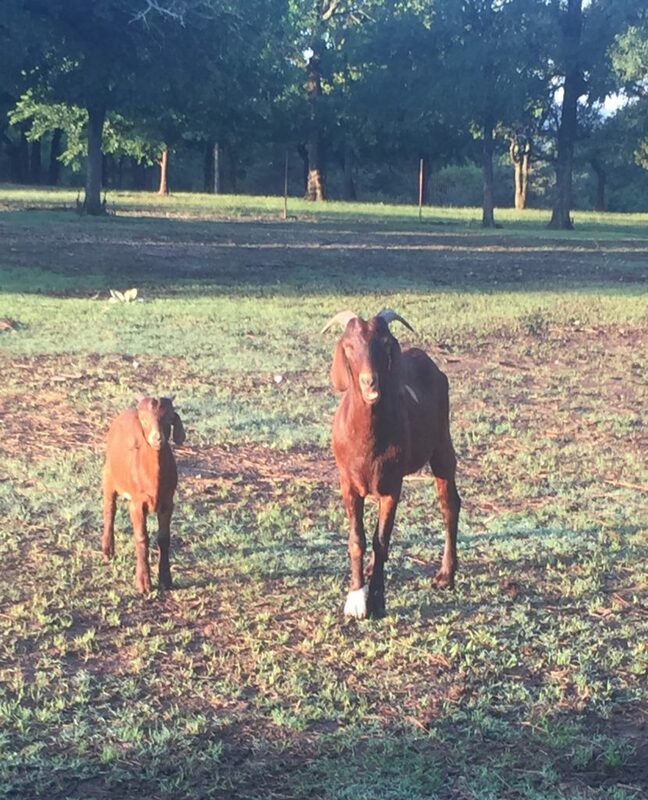 I keep them in their stalls with runs when it rains a lot so they don’t destroy the pasture or hurt themselves by playing in the mud. We awoke this morning to ICE! Temps were around the high 20s, but thankfully the ice wasn’t really sticking. 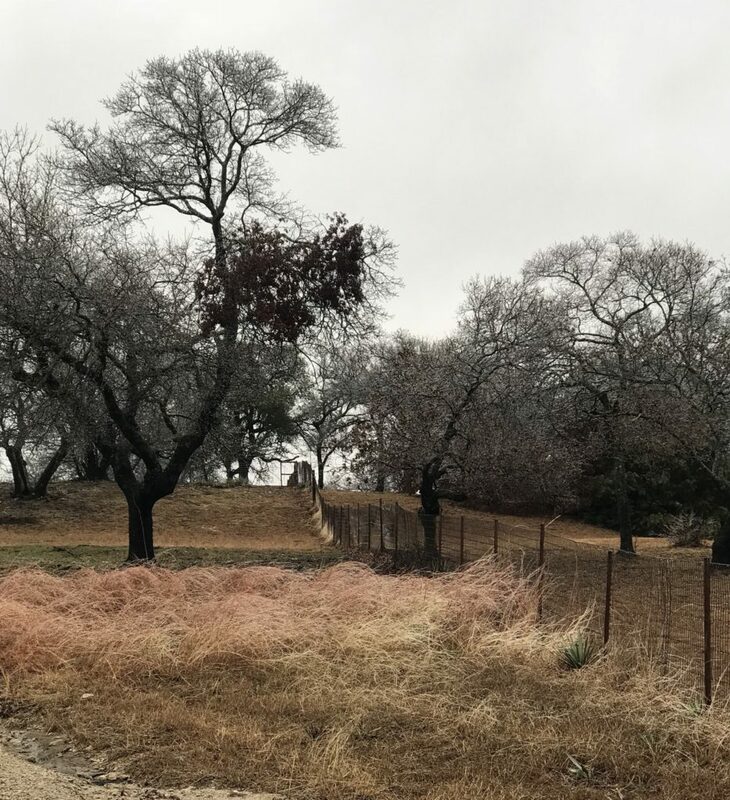 I opted for a delayed trip to work to avoid the crazy Texas drivers in the ice and rain so I snapped a few pics around the farm. Ice on the trees is almost as pretty as hoarfrost. It has been three years since we have had a good snow. Hopefully winter 2018-2019 will deliver. 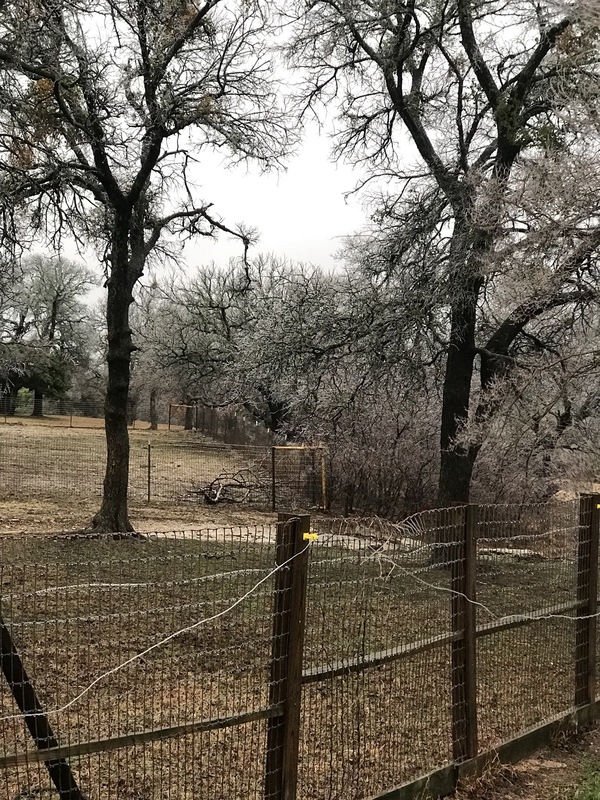 Icy trees outside the backyard and in the goat pen. The crape myrtles always look pretty when they have ice or frost. Ours are crazy tall! 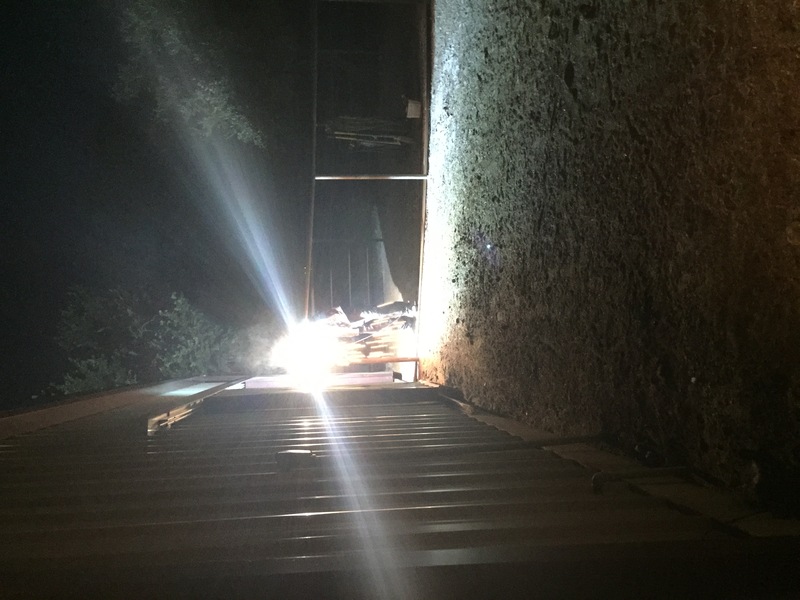 None of the horses have stepped foot out of their stalls in about 24 hours. Here you can see Coco sneaking a peak of the rain, but definitely not going out into it! The tall native grass got smushed by the ice. I hope everyone in North Texas stays safe in this weather! I read about some tornadoes in Johnson county. Ugh. Just what I need while I’m getting ready to head to a horse show! This was a relatively quiet week at the farm. The weather is heating up to typical Texas summer temps, which makes me kind of sad. The spring and fall here are delightful, but the summers really are brutal! Sweet little Harriet had her first heartworm injection this week. She was quite lethargic the first day, but has pepped up since. She will have two more injections in a month and hopefully will then be cured and ready to be adopted! I can’t even with these two! This is no less than 150 pounds of dog on one dog bed. 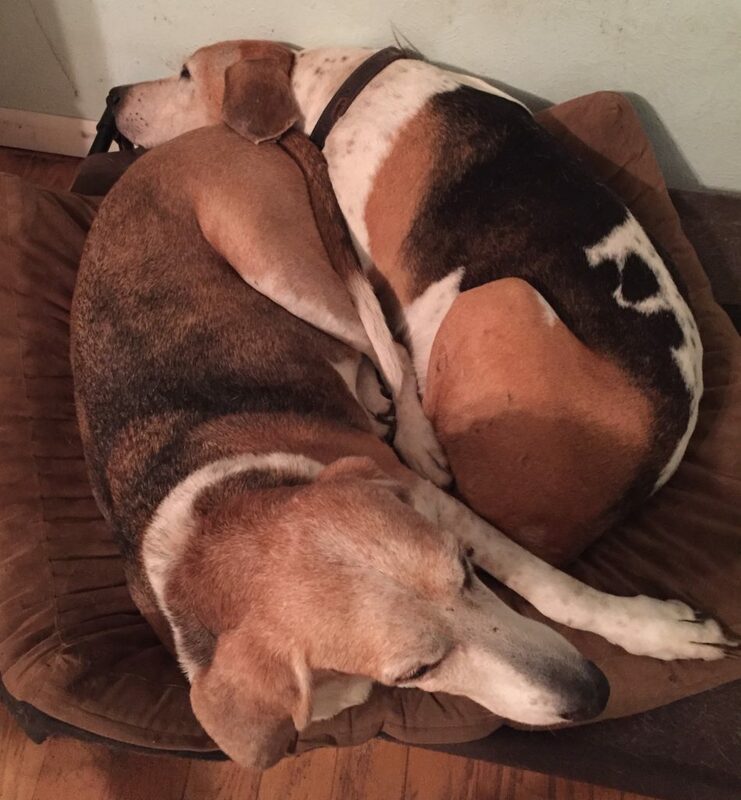 Never mind that there are at least two other same-sized dog beds they can use. This is Mickey, our most recent foster from the Fort Worth shelter. He is your typical 6 pound dog who acts like he is 60 pounds! He is also heartworm positive so will be starting treatment soon. In the meantime he is trying his paw at goat herding. Pardon her closed eyes, but this is Coco modeling her new fly sheet. 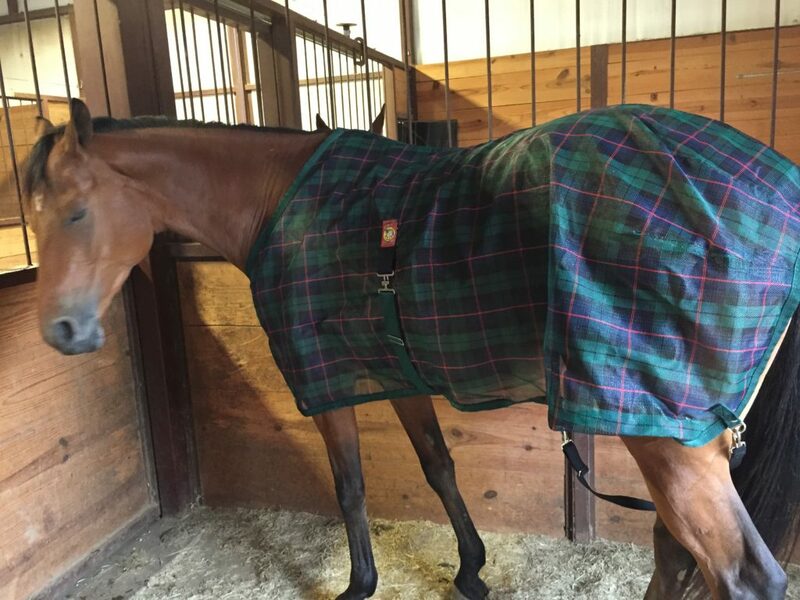 She is a solid 16hh so I have mostly bought her sheets and blankets sized for a horse that tall, which is generally a 75-78 depending on their body type. Well, Coco has a very compact body and she was tearing up her size 76 fly sheet because it was too big and didn’t fit her correctly. This sheet is a 72. She is so petite! This photo is a barn evening in a nutshell! Peaches asleep in the middle of the doorway. 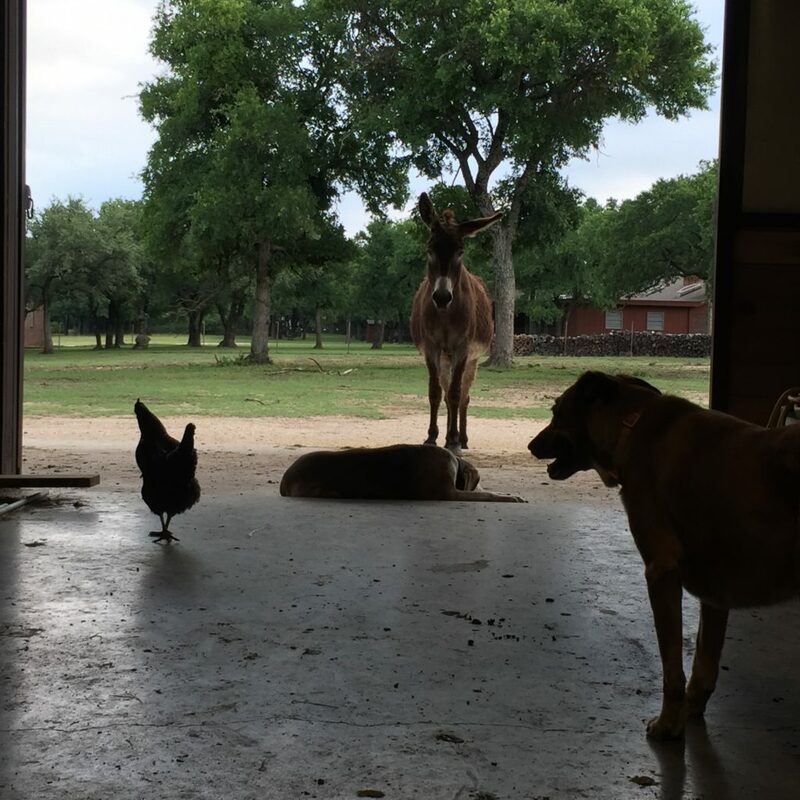 Quila chasing chickens trying to find eggs to eat and chickens wandering in the barn aisle and pooping on the floor. When I woke up this morning I was pretty sure someone outside was flipping a light switch off and on. In reality, it was Mother Nature. I check the weather pretty religiously and I’m confident there were slim to no chances for storms today. Alas, by the time I was finishing up feeding the horses it was POURING rain! We are still a few inches behind average rainfall, so I’ll take it! This was Pablo’s feed pan when I got home from a work trip last Friday. 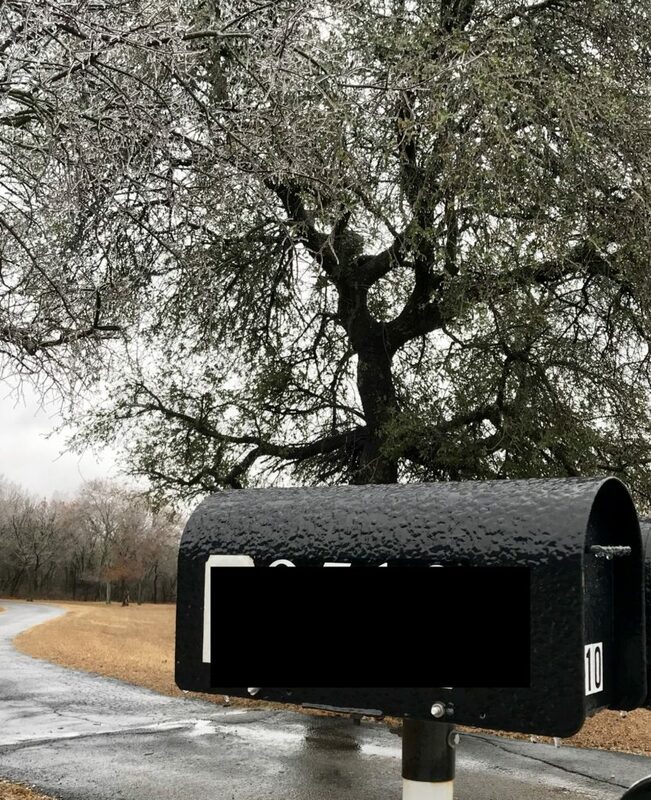 It rained over 3.5″ that day! How many hens can you find in this photo? 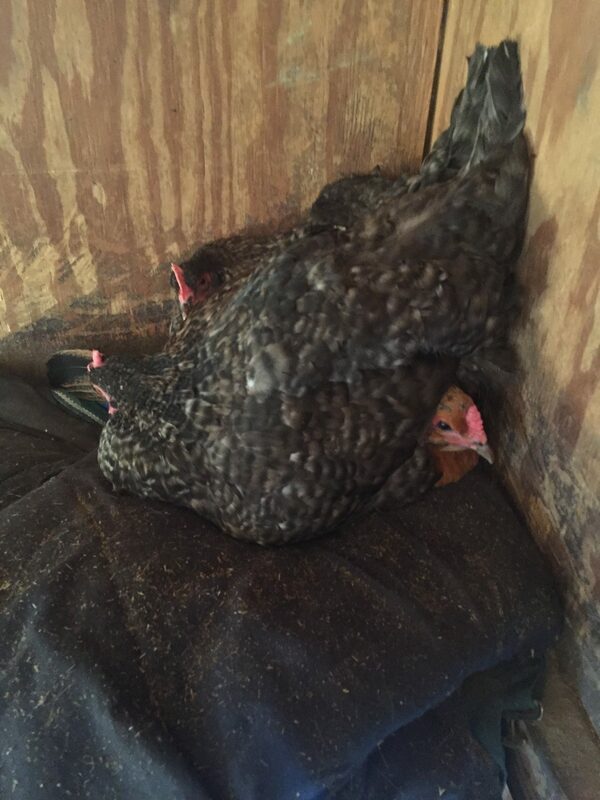 They are ALL broody and stay in this position, more or less, 24/7. Chicken ridiculousness. 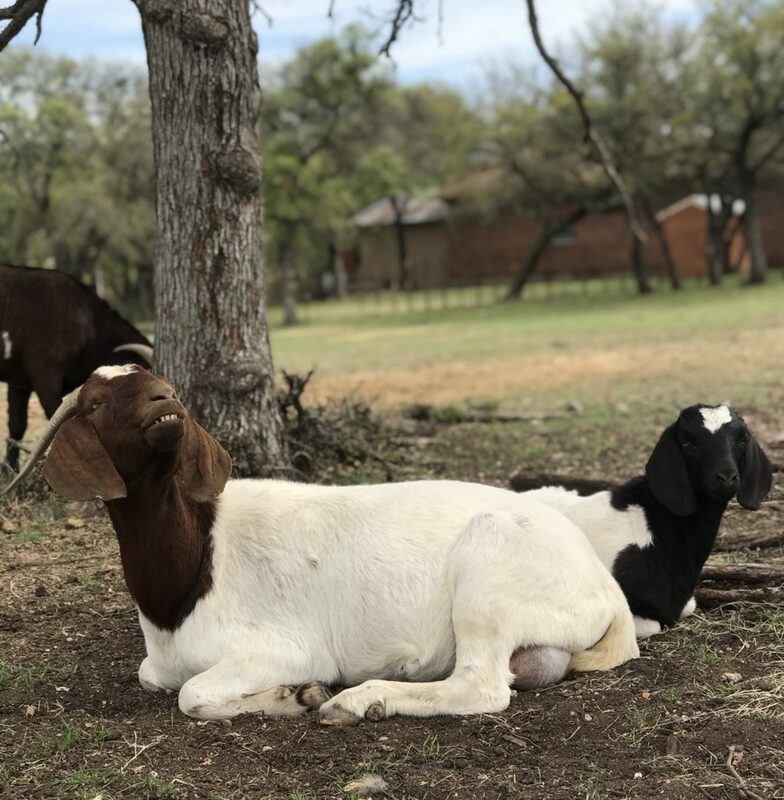 These two are goat brothers. I think it is so cute they are the same color! 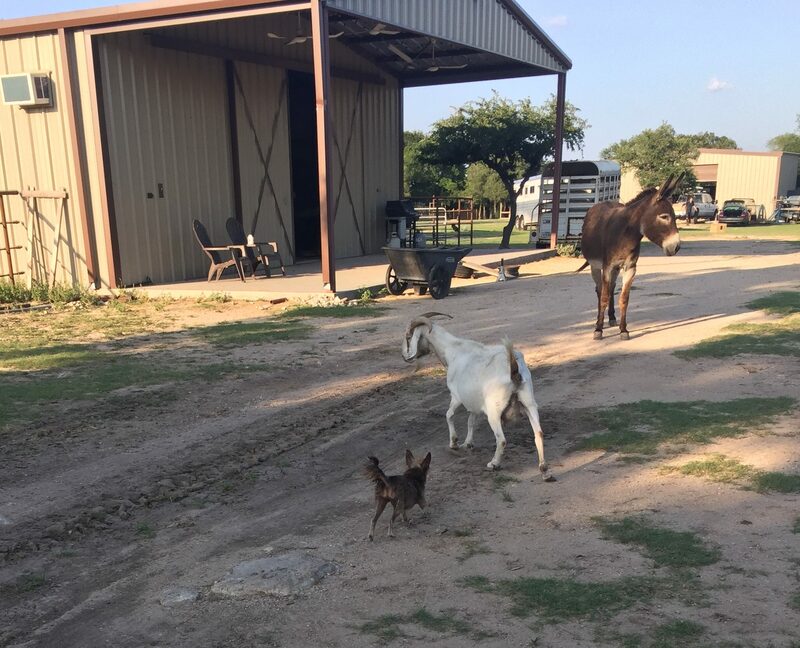 The little guy is for sale if you are in the market for a baby goat. 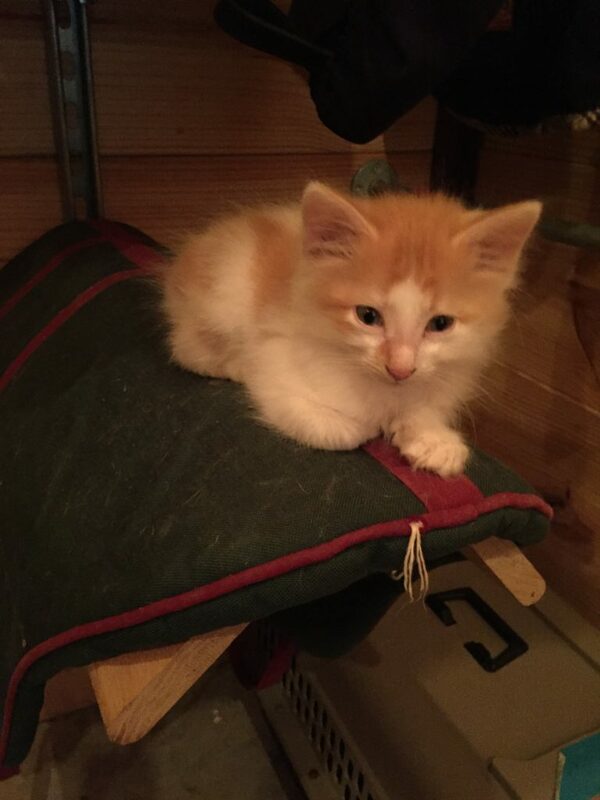 One of our adorbs foster kittens. They go to the Humane Society of North Texas this weekend and will be available for adoption! Get you a kitty! Most husbands are somewhat handy at wood working. Mine is decidedly not very handy at wood working; his speciality is working with metal. Therefore many structures that would be made of wood at a wood worker’s home are made of metal at our home. This makes for some VERY heavy duty bridle racks and saddle racks that you could hang a sofa from. 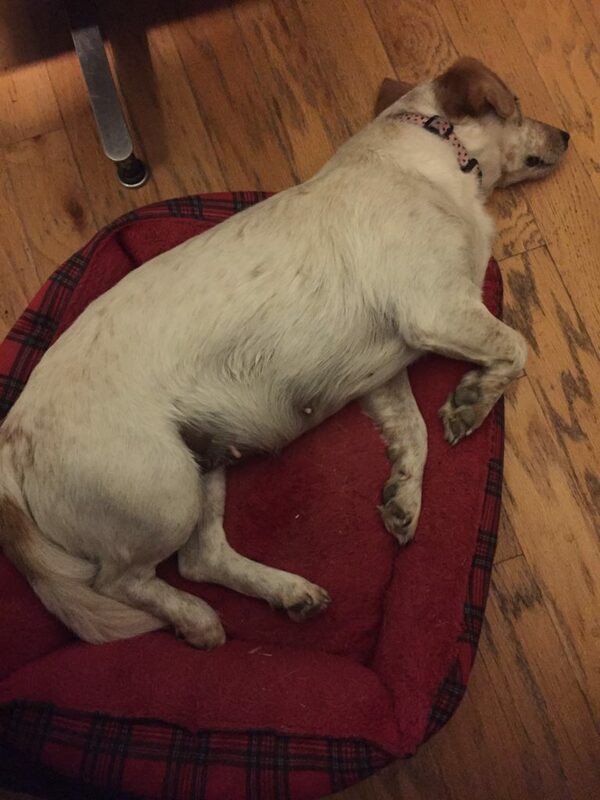 Most recently Boot City stepped up to make a stall run for the “bed-ridden” Coco Chanel during her 6 week layup. 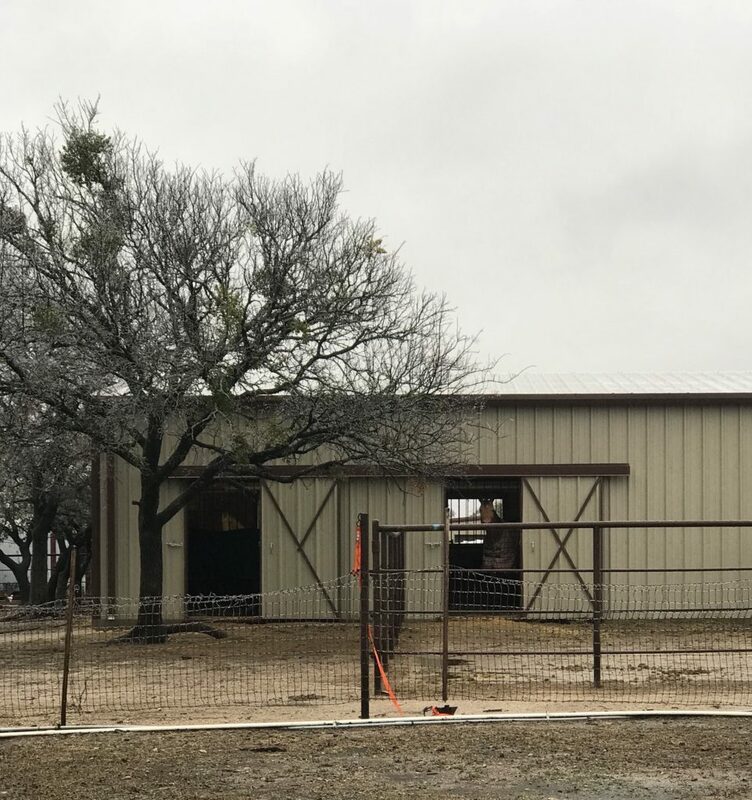 We had planned to have stall runs on all four stalls on the “new” barn from the get-go, but time and funding are not always readily available so nothing happened until there was an express NEED for a stall run. We did a great deal of internet research about design; how far apart should the pipes be, how far off the ground should the lowest rung measure, how heavy duty do the pipes need to be and all kinds of safety and convenience research. Human nature is to repeat what we know worked in the past. My parents had runs off the stalls on their barn in Montana so that was the basis for our design. We altered it slightly by putting fewer pipes and having the bottom rung further off the ground to prevent trapping legs. We beefed up the size of the frame pipes and opted for 1 1/2″ sucker rod for the bottom 3 rows. This is the finished product plus horse. Coco outside in her run on the first night it was open for business. Boot City is all about building things to be very sturdy. This time around he put posts in the ground at least every 8 feet and in the case of invasive tree roots he put them even closer so as to not have to harm the roots.The closer the poles in the ground are to one another the sturdier they are because there is less room between bracing for the horizontal pipes. Poles in the ground. I promise that all of them are nearly perfectly straight. Boot City doesn’t mess around. The whole project took about three weeks from start to finish. I really and truly thought it could be done in a couple days, but that was unrealistic wishful thinking. The concrete had to set for the poles in the ground to be sturdy enough to weld on and the measuring and levelling is extremely tedious work. Boot City finished the fencing late on a Wednesday night and Coco will be forever grateful. 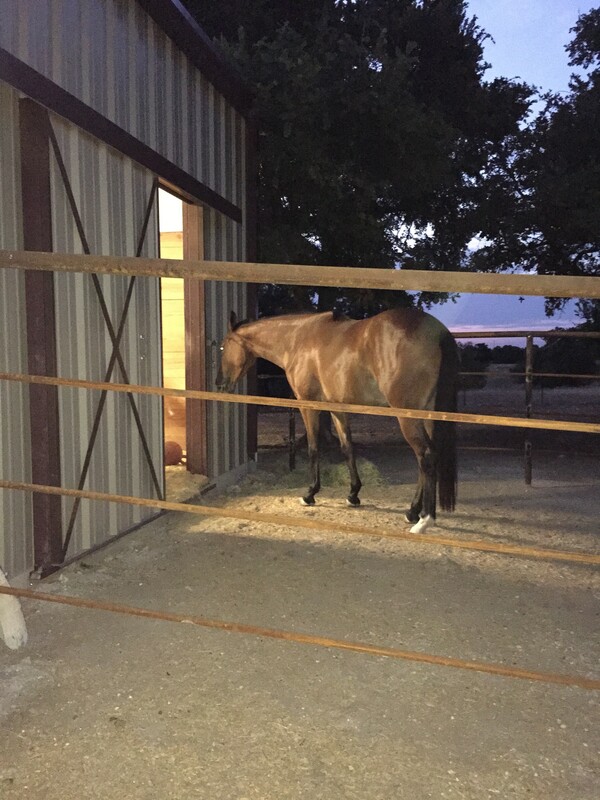 The plan is to complete her neighbor’s stall run in the coming months, but emphasis is now on putting in a property gate, updating fencing by the house and finished the “nursery” AKA the paddock fencing for Coco and her new foal come March. Most anyone who knows me very well knows that I love winter. When people ask me if I moved to Texas for the weather, I tell them I moved to Texas DESPITE the weather. I don’t love hot summers. What I love most about Texas is horses, but that is for another post. Having grown up in rural Montana I took for granted how much more prepared communities in the northern climates are for below freezing temperatures. I don’t ever remember being really truly concerned about pipes freezing or having to haul water to the horses during winters in Montana. And that is really saying something considering it wasn’t terribly unusual for temps to dip well below zero for days or weeks at a time. Now that I’m a “grown up” living in Texas I still love winter, but those cold snaps bring with them a LOT of work! First and foremost our property sits on solid limestone. As in you can’t dig a hole much deeper than 6-9″ without hitting sold rock. That means none of our pipes aren’t much below 6-9″ underground and therefore are prone to breaking when they have water in them and freeze. FUN! We’ve always been pretty good about turning the water off to the barn when it freezes, but we had a lapse in judgement this year and now have the fantastic chore of fixing a broken pipe. Enter stage left the perfect husband who can fix it himself rather than have to wait on a plumber. Another winter issue is food. A horse’s natural heater is hay. Eating hay all day long runs their internal heater and keeps them warm. This means they eat a LOT more hay than usual. A LOT. My three usually get about a full bale each day in moderate temps, a bit less than that when there is lots of green grass. During the recent cold snaps I was feeding 2 bales per day. 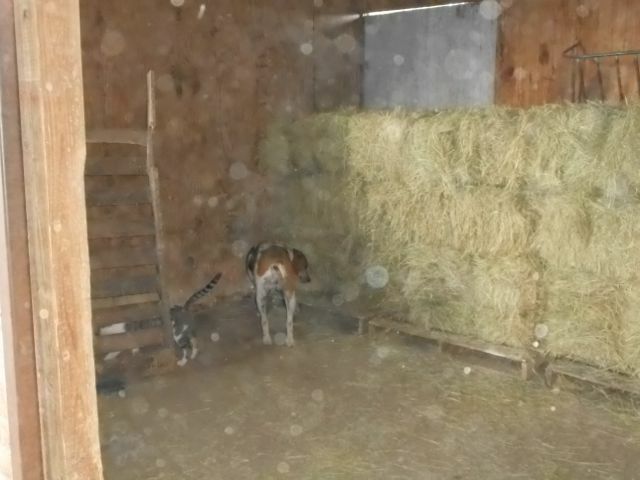 That is with a fully insulated barn, 2 with full winter hair coats and 1 with a full collection of the latest Baker blankets and sheets to keep him warm. 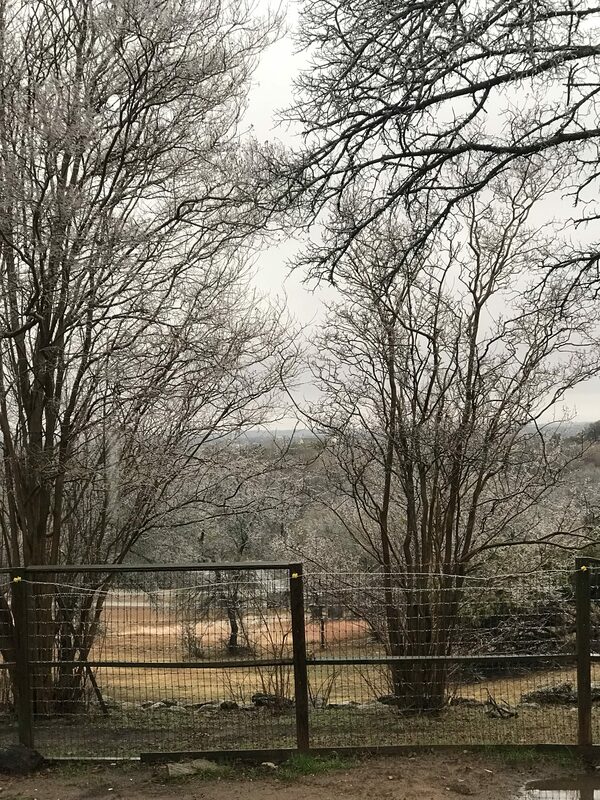 I’m a big believer in not locking my horses in the barn when it gets icy/snowy as long as they can get out of the elements and away from the wind. Jaguar, having grown up in the tundra of Eastern Montana, generally thinks Texas winters are a joke and scoffs at his pasture mates for being wimps. 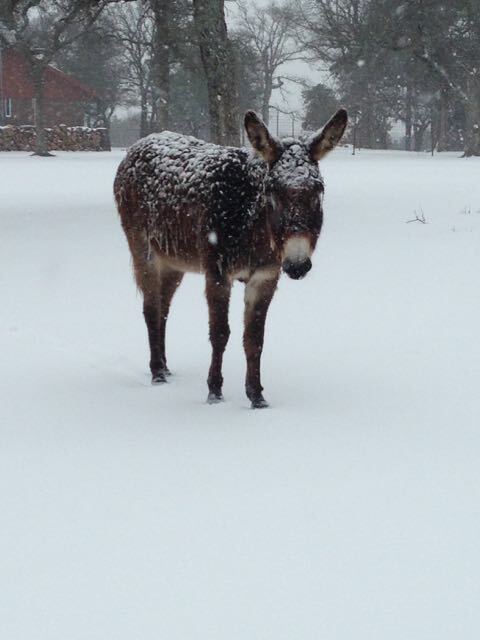 This generally results in him keeping all the other horses and donkey out in the elements much longer than they ever would have without his leadership and Pablo inevitably loses and ends up a donkeycicle. 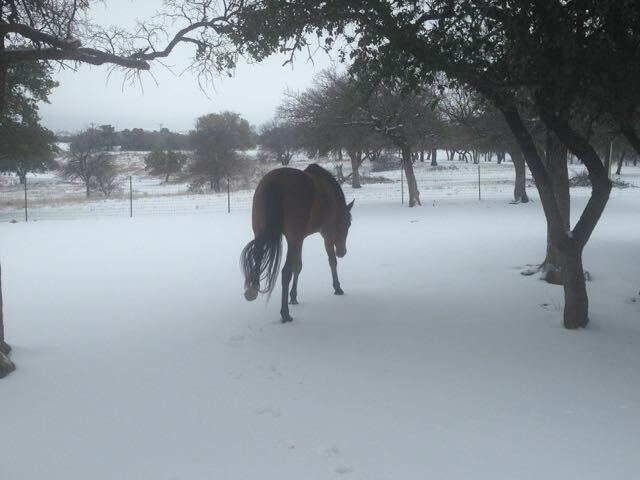 In addition to feeding the internal horse heaters, we have to be mindful of ice/snow buildup in their hooves. In their natural habitat as a “wild” horse, their feet acclimate to the geography where they live. This serves them in many ways, but in the winter especially their hooves have adapted to not letting snow/ice build up and cause them to slip. By living in an unnatural environment and often having shoes on, we owners need to be sure to pick out their hooves and even put something like Crisco in them to prevent the ice/snow from building up. Only one of my steeds has shoes on (Jaguar), but they all need their feet cleaned out at least once, generally twice a day to prevent a big ball of ice from forming and causing them to fall. The last thing I need is for one of them to slip on snow/ice and have a vet call on top of the amazing thundersleetnado conditions. 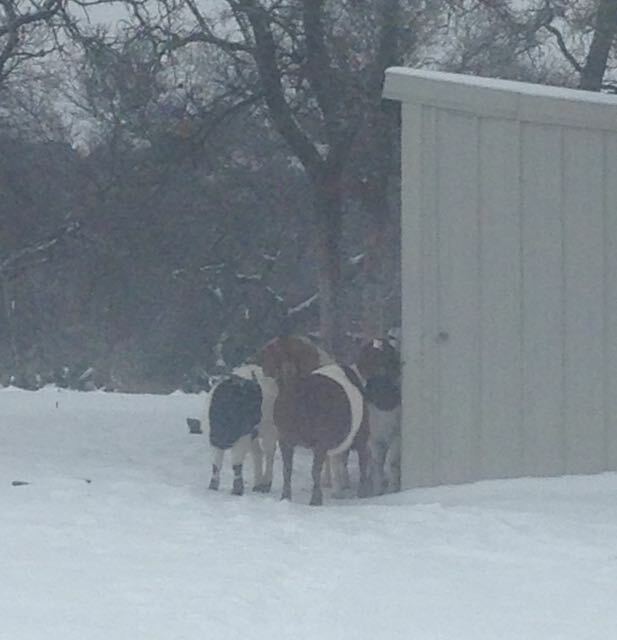 Our other main concern/high maintenance creatures during cold weather are the goats. I may have mentioned this before, but goats are made of sugar. If they so much as get a rain drop or a snowflake on them they are likely to melt away into puddles of nothing. For this reason they require all food and water be brought directly to them during conditions of most anything other than sunny to partly sunny. During exceptionally cold weather it is preferable that the water be warm. Seriously. Do they have our number or what?! 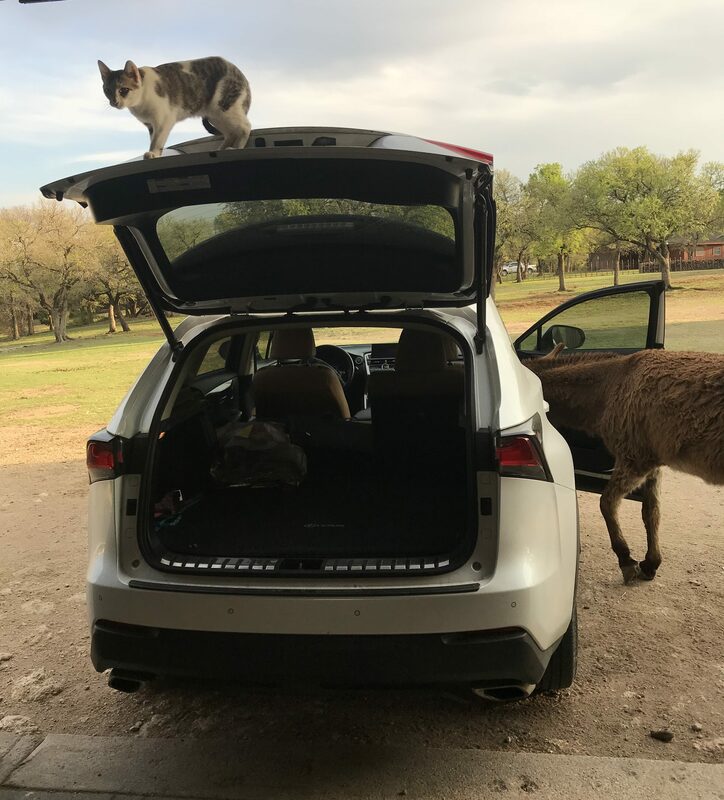 We are expecting goat babies soon so we gave in to their neediness in order to provide them and their unborn kids all the sustenance they require. Do I still love winter? YES! Freezing weather means less bugs in the spring/summer and I tend to better appreciate the warmer days when I’ve had to suffer through some cold ones. If I lived in a climate where the weather was the same every day (ahem, California) I’m entirely confident I’d develop some sort of seasonal affective disorder. And now that the snow and ice have melted I can look forward to our wild daffodils and SPRING! First off, I’m sorry for the inadvertent blogging hiatus! For a girl with 10 planners, my time management isn’t the best. Hopefully I’m back on track to post here regularly. 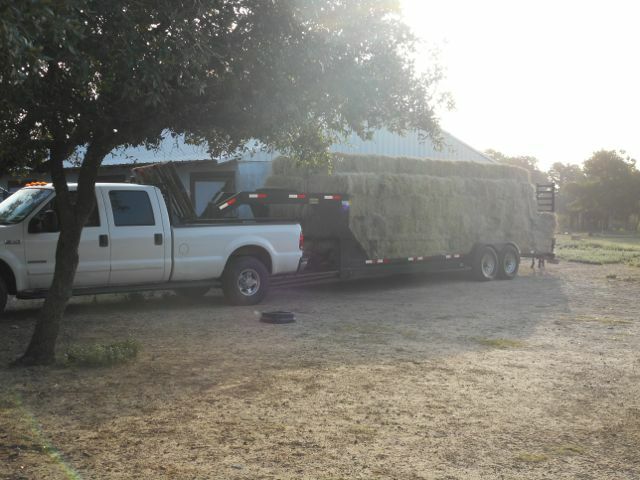 Summertime for horse owners (and keeping them at home) means hauling hay. 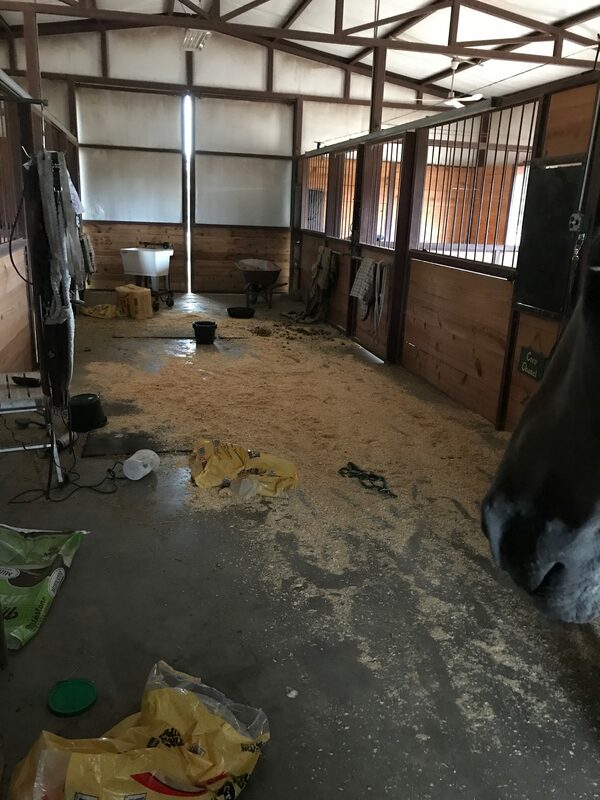 It is one of the least glamorous aspects of horse ownership. There is nothing quite like being hot and sweaty with hay in your socks, in your shoes, in your mouth, in your shirt, well, you get the point. When planning how much hay to buy every year, I usually get one bale for every day, so around 365 bales. They are about 50lb bales and most every year I run out of hay at least 3 months before the next harvest. Cold winters put a bigger dent in the hay supply, too. 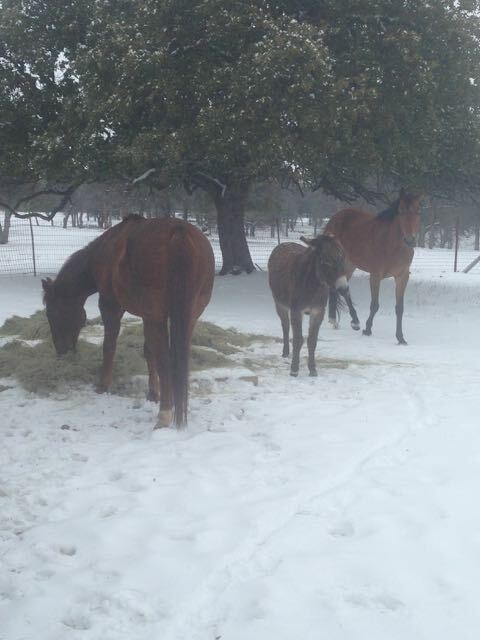 Horses stay warm by eating hay, it gets their internal furnace burning. My hope is that with one less horse and improved math skills I will get enough hay this year! It costs twice as much to buy hay from the feed store than to buy it directly from the supplier so is MUCH nicer on the feed budget! All ready to unload. Who needs boot camp with this workout! The supplier I buy from is gracious enough to let us drop off our trailer and load it for us. This way all we have to do is take it home and stack it in our barn. 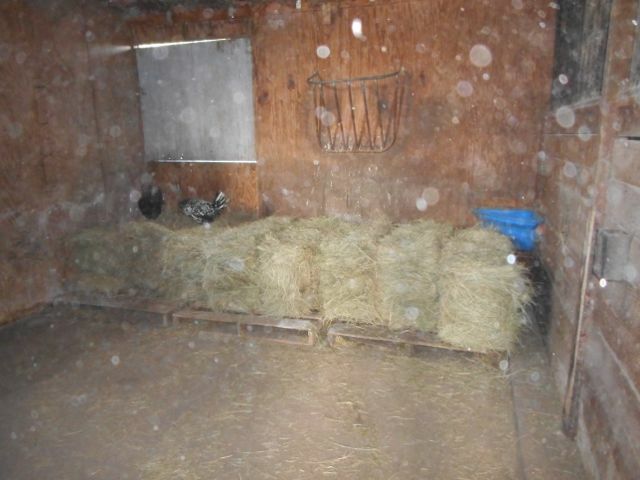 When we built the new horse barn we started using the old barn exclusively for feed storage and as the chicken coop. 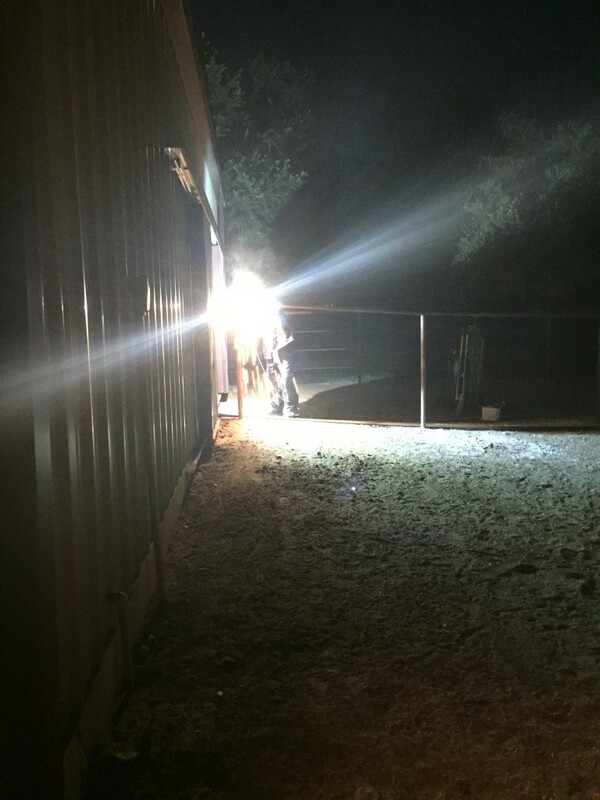 This lowers the fire danger in the new barn and reduces the amount of dust. This first load of the summer was few bales short of 150. We will get another similarly sized load later this summer and then hopefully one final small load before the hay is gone. We have lots of helpers to inspect the hay as we unload and load. 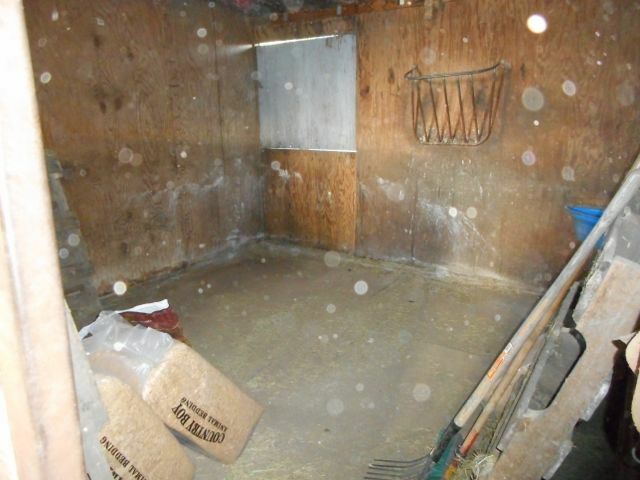 We clean out the hay room before refilling it with hay. This requires taking out all the pallets and lots of sweeping. We probably should wear breathing masks because of the dust, but we didn’t plan for that this year. It gets REALLY dusty! You’ll see the dust in quite a few of the pictures. It makes me feel like sneezing just looking at the photos! All cleaned out and ready for pallets and HAY! I learned at a very young age how to properly stack hay. 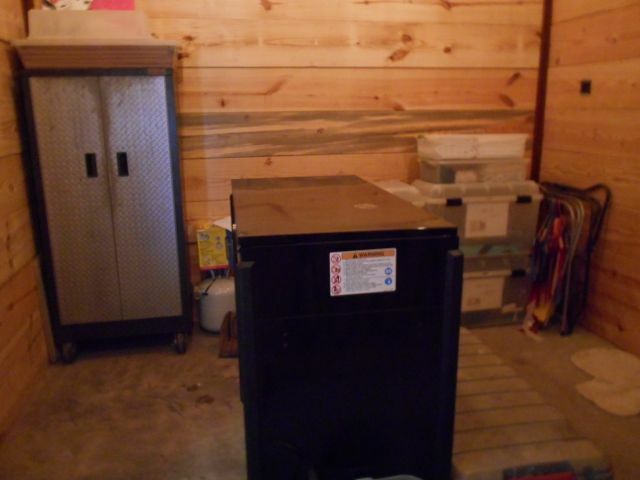 You want to create a stable base for the stack and fit as many bales in a small space as possible. After the base layer is down, you stack the next layer flat on and perpendicular the base bales. Each additional layer goes on the same way. Only the base bales are laid on the narrow side. The rest of the layers are laid on their widest side. It usually takes a couple hours to stack 150 bales. I do most of the stacking and get Boot City to help with the top two layers. He’s taller and has more arm strength than I have to get the bales up that high. 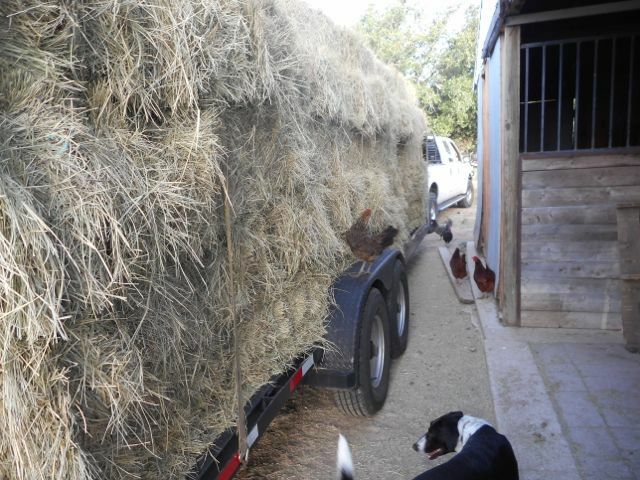 It feels SO good to be done stacking the hay and be prepared for the upcoming fall and winter with lots of hay for hungry horses (and sometimes goats). « Happy Independence Day Y’all! The main reason I initially joined Pinterest was to save links to photos of horse barns and layout ideas for the feed room and tack room. 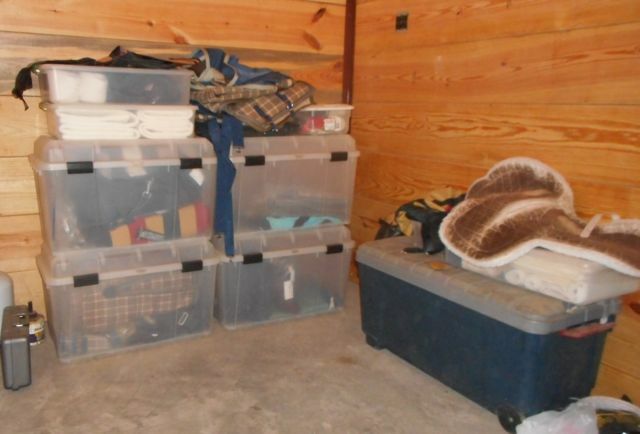 I’ve gotten some good ideas from my Pinterest stalking, but never any that met my needs for horse blanket storage. So I came up with my very own idea and am posting it on my blog so OTHER people can be inspired by my blanket organization idea. As with any organization project it is of course a work in progress. A few months ago I went through all of my horse blankets and made a list of them in my horse planner (yes, I keep paper planners still) by size. 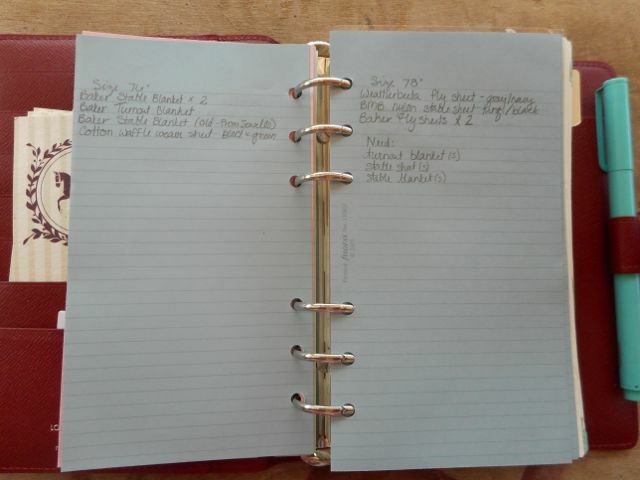 This is similar to my horse planner. Mine is the next larger size, but isn’t currently available on the website. I listed what I have and what I need to add to my collection. I had already put the different sizes in these large, clear trunks that some friends gave us. I love them because they are see through so I can at least get an idea of what is in each trunk. 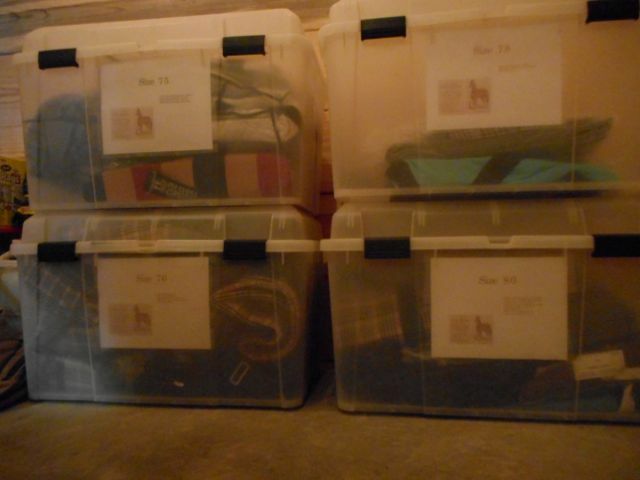 The blanket trunks before the re-org. Most things I read about organizing horse blankets had them sorted by season, which I get, but doesn’t really work for me. I only have three horses and to me it made more sense to sort by size. I have a pretty good idea what I have for each season, I have more trouble figuring out the right size for each horse. 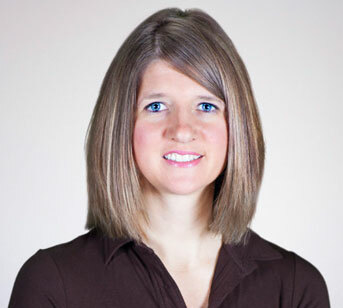 I prefer to be able to quickly find the right size and determine if I have what I need. The sizes I have the most blankets in are 75, 76, 78 and 80 so each trunk got a poster that indicates which size is in the trunk and what blankets and sheets I have in that size. And since the trunks are see-through I can easily read the outside and know if I have what I need. If I don’t have what I need, I have an excuse to go horse shopping. Yay! All of the blankets are thoroughly washed and inspected for tears before storing. If my collection gets much bigger I’ll buy the vacuum bags from Container Store to save space. I added the lovely clip art to the posters to add ambience to my tack room. I’m pretty excited how neat and tidy my tack room is now. I also took the time to move my Gladiator armoire from our old dilapidated barn into the new tack room to use for additional storage. The more stuff I can get off the ground and into it’s place the happier I am. 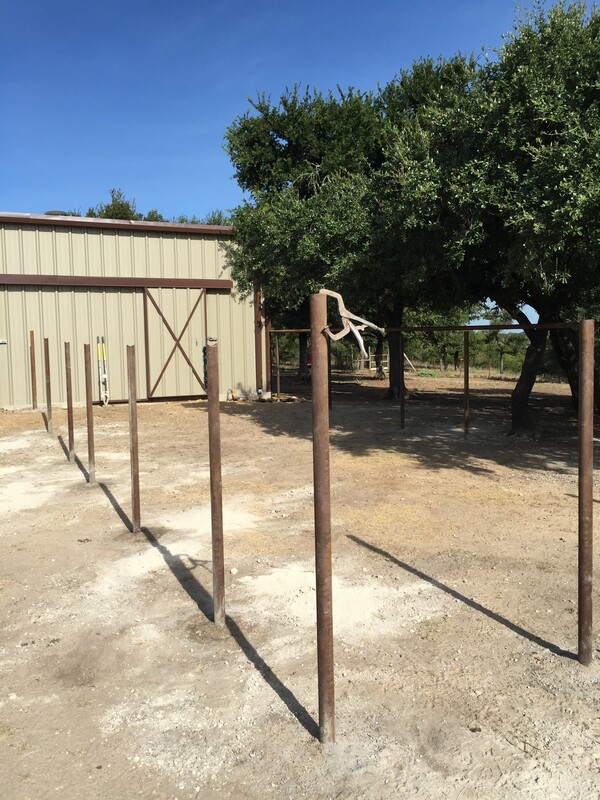 South side view of the tack room. You’ll probably notice that I also have a Snap-on tool chest, too. When married to a mechanic you take what you can get and I don’t think it’s that terrible to have a $2,600 tool chest to store leg wraps and horse brushes! At some point I’ll do a retro post and put up the pics of when we built the barn. I LOVE my barn. LOVE IT. 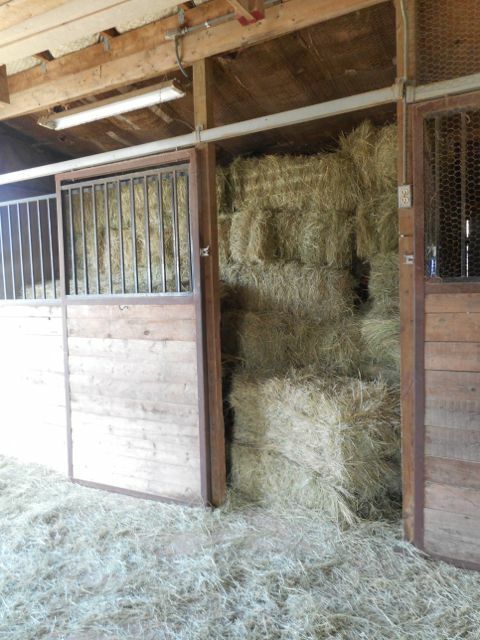 Having the right space to store horses and their paraphernalia has made my time so much more efficient and enjoyable at the barn.